At one time BlueVolt was just a spark, a system among many other systems in the market. Those days are gone forever. BlueVolt is an electrically charged LMS, that harnesses key elements to make it formidable extended enterprise competitor to Absorb. Mobile Learning – yes you can view it on tablets and smartphones. Built in Content Authoring Tool – No. IMO, not a big deal. Many people today prefer 3rd party authoring tools and in fact, I recommend that route rather then using a vendor’s built in authoring tool. Transcript tab also includes the ability to add a course to the transcript (I assume this can be turned off by the admin, if you do not wish your end users this capability) and the capability to print. Please note, that you do not have to use $BlueBucks as part of your system. It is completely optional. Thus if you decide not to offer it, you would turn off the tab in the “My Account” section as well as in the header/footer. Featured Items- this can be WBT, seminars – online or offline (ILT), resources, videos, etc. – interesting to note, that for “events” color codes are used – orangewith the text “in-person”, blue with the text “online”. And if applicable – estimated total number of hours to complete the course/materials/etc. Finding out the progress is a tad funky, because you can some customization involved – which while that may seem like a great idea – the customization does not enable a progress bar or some type of graphical interface. 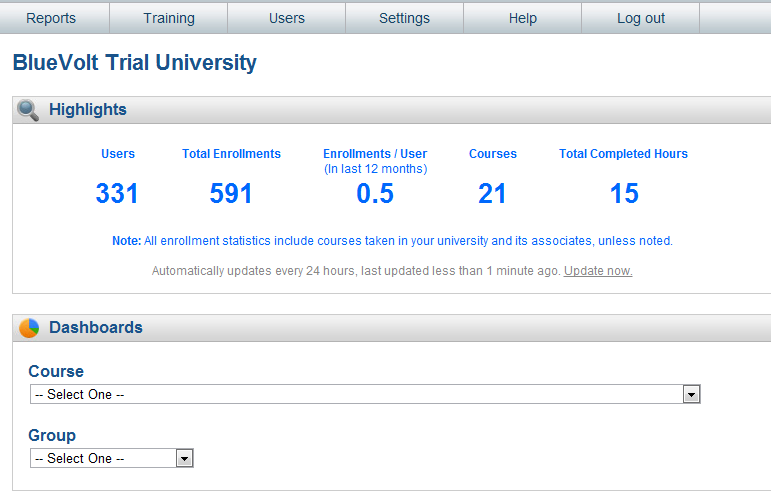 Ideally for me, it would be great to have a graphical interface identifying “not enrolled”, “enrolled” and “completed”. Thus, not enrolled would be blank on the progress bar, but with the words “not enrolled”, enrolled would be yellow in bar, with “enrolled” in the text and completed would be “green” with completed. If the course was overdue, the bar would change to red. This format is common when people create effective user guides or QRCs for training, even a navigation guide for online courses. Anyway, its just a thought. While this system is extremely effective, I found the whole “course” and “category” think strange. I clearly understand “courses” and what falls under that, but “category” can appear as well, and under it could be courses, resources, etc. – In a way it seems repetitive. Category can be beneficial with the subjects available, then people click on the subject/topic and drills down to the course. Categories can also be beneficial using the same hierarchy for say resources – either by subject area or type and then drill down from that. While it is true that categories contains everything and thus a search can be done with a click here or there, the same can occur in courses – as the above example illustrates. 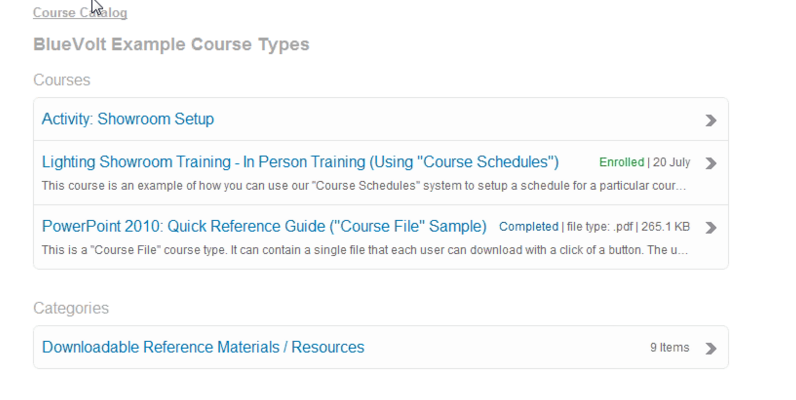 Under course is a PPT 2010 QRC, yet under the categories section, you see “downloadable reference”. Guess what? The QRC is visible in there too. It should be noted that a “search” function is available on the screen – so searching by keywords is available to the end user as well as by pin code. The learner can view the “outline” of the course, by clicking “outline”. If you are using the $BlueBucks feature, the number of BBs is listed too. As with any incentive or reward program, the learner receives something “hence the incentive”. While there are a few vendors who offer the incentive angle, it is up to the customer to pay for the incentive or in many cases it is the usual “company mug” or “free courses” angle. As early noted, while you could do this – I’ve found that most people want something tangible and specifically something more than the company t-shirt or mug. People love gift cards – and with over 100 vendors to select from – already put in play through BlueVolt – you simply select which gift cards and whalla – of you go. Of course, you have to have a budget for the gift cards. According to BlueVolt, companies – clients who use BBs have seen a significant uptick in the number of learners completing courses versus not offering BBs. While I could equally spend a few thousand words with all the capabilities and features of the administration side, here is the initial dashboard you will see upon entering the admin side. When you select a group, the screen looks a tad different from the course screen. 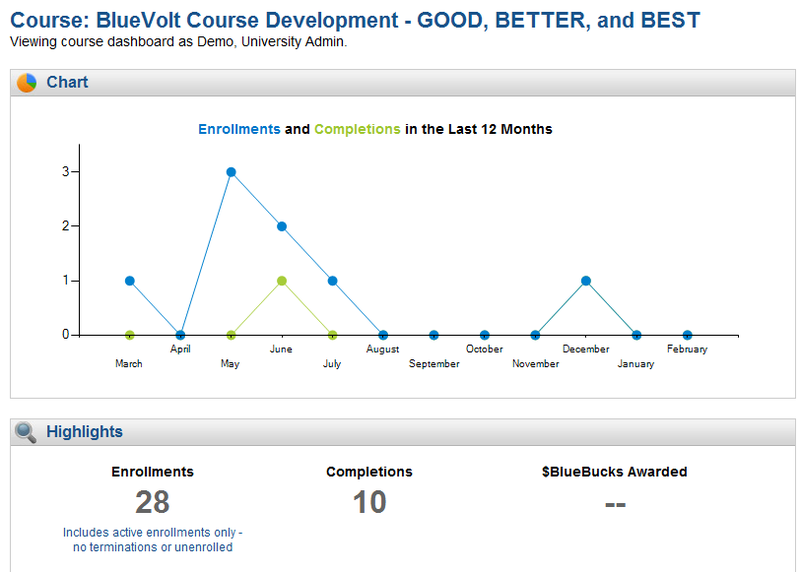 While the graphical interface is still visible – with enrollments and completions for the past 12 months, the highlights are different. 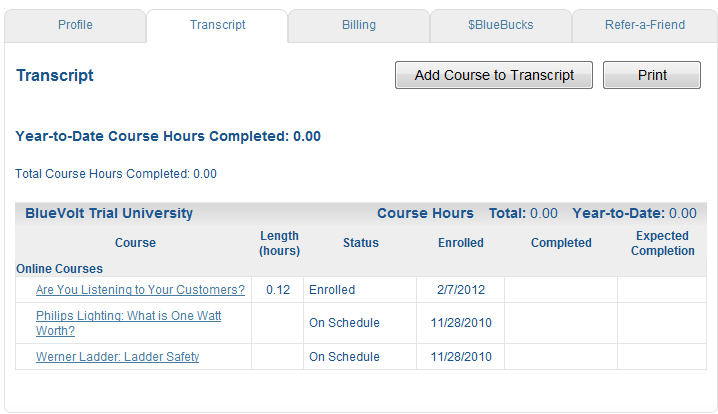 They are listed by the group, with the top being “enrollments”, “completions”, “course hours” and “$bluebucks awarded”. Reports and actions equally change. Under the actions area – edit groups, add or remove groups, edit roles, create users in group, create user, choose another dashboard, e-mail dashboard. Reports – contains very useful reports beyond what is listed under the “snapshot” of the dashboards – reports are broken out by users, courses and $BlueBucks. Under each sub-category contain the essential reports you need. As earlier noted, Blue Volt enables you to create ad-hoc reports. While their core audiences are manufacturers, services, distributors and associations, this system can easily be recommended to any business or organization. Overall this system is a powerful ride on the extended enterprise LMS highway.